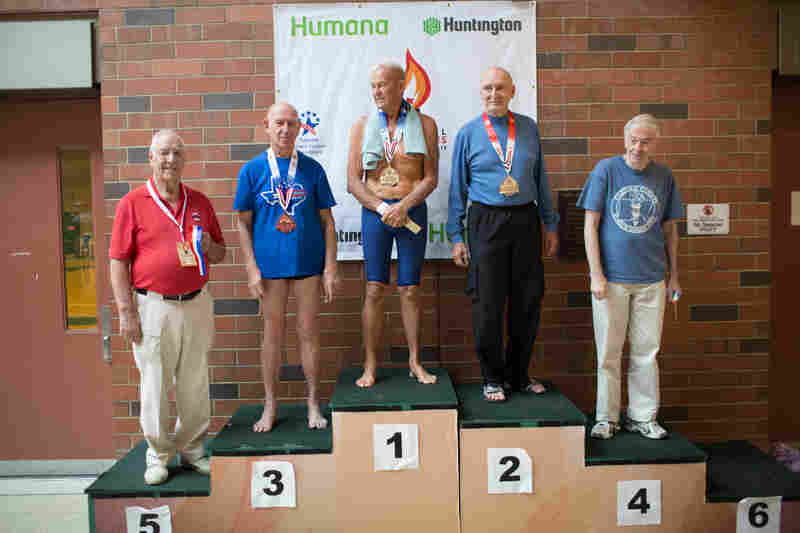 Age Hasn't Stopped This Man From Swimming — And Winning Swimmer Graham Johnston, who's in his 80s now, is competing in the Senior Olympics in Cleveland. 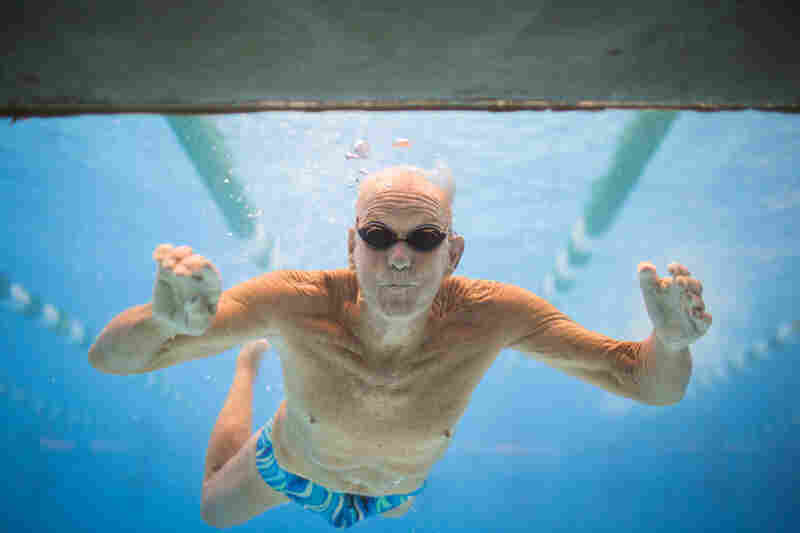 He's been swimming all his life, including competing at the 1952 Olympics for his home country of South Africa. Even at his age, he still trains five to six times a week. Graham Johnston, 82, poses for a portrait through an underwater window at the pool on Wednesday. Graham competed at the Senior Games in Cleveland, where more than 10,000 athletes older than 55 are competing in various sports. Johnston adjusts his suit before warming up for his events. He started swimming at the age of 2 and now practices five and sometimes six days a week. Johnston dives in during the individual medley finals for the 80-to-84 age group. 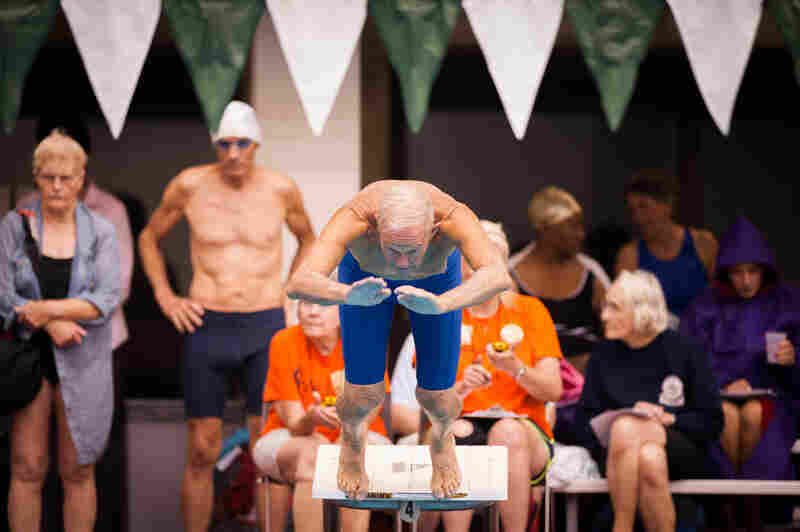 Over the decades, Johnston has set world records in various age groups for older swimmers. Johnston swims the backstroke during the medley finals for the 80-to-84 group. He represented South Africa, where he's originally from, in the 1952 Olympics but missed the finals by one spot. Johnston gives his wife, Janice, a thumbs up after winning his heat of the medley with a time of 1:31:88. He came to the United States on a swimming scholarship at the University of Oklahoma, where he also met his wife. Johnston discusses medications with Burt Bronk, 82, in the locker room. The two didn't compete together, but Bronk won first place in the men's 80-to-84 100-yard butterfly. Johnston stands at the top of the podium for the 100-yard freestyle 80-to-84 age group awards at the Cleveland State University Natatorium on Wednesday. 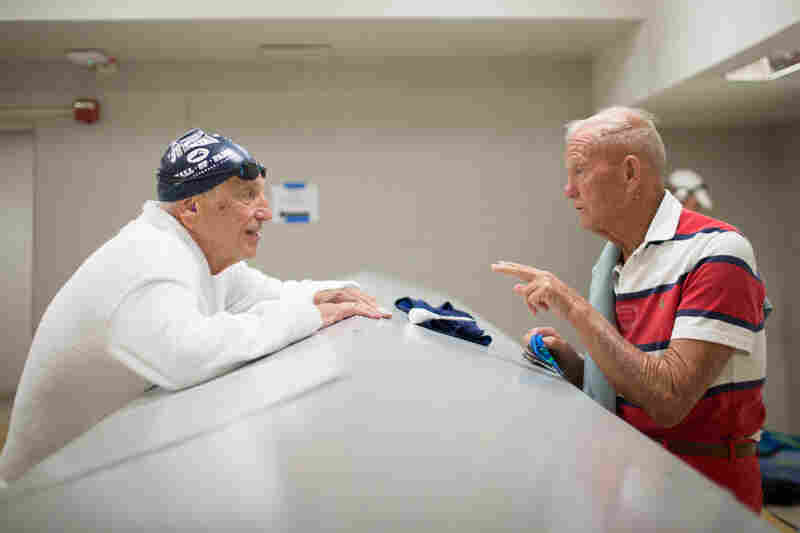 Graham and Peter Vandijk (second place) have been swimming against each other for 40 years. More than 10,000 athletes are meeting in Cleveland for The National Senior Games. 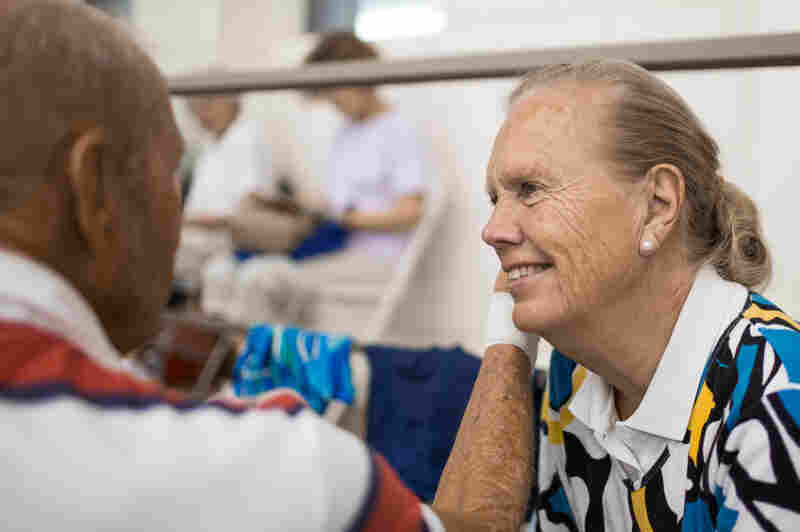 Adults older than 55 — and some older than 90 — are running track, riding bikes, playing basketball and competing in many of the sports you might see at the Summer Olympics. In fact there are a few who were Olympians themselves back in the day who say they find that competition is just as satisfying in their later years. One of those is 82-year-old swimmer Graham Johnston. When he's not racing or getting ready to race, he's in the stands, checking out the other swimmers with an expert eye. "See," he says, pointing at one competitor, "he took a breath on the turn. Shouldn't have done that." But when it's over, he applauds and shouts "Great race" to all the swimmers. And Johnston knows a great race when he sees one. He's been swimming since the age of 2. "My father was a manager of a swimming pool," he explains. And there wasn't a lot else to do in the small South African town where he grew up. 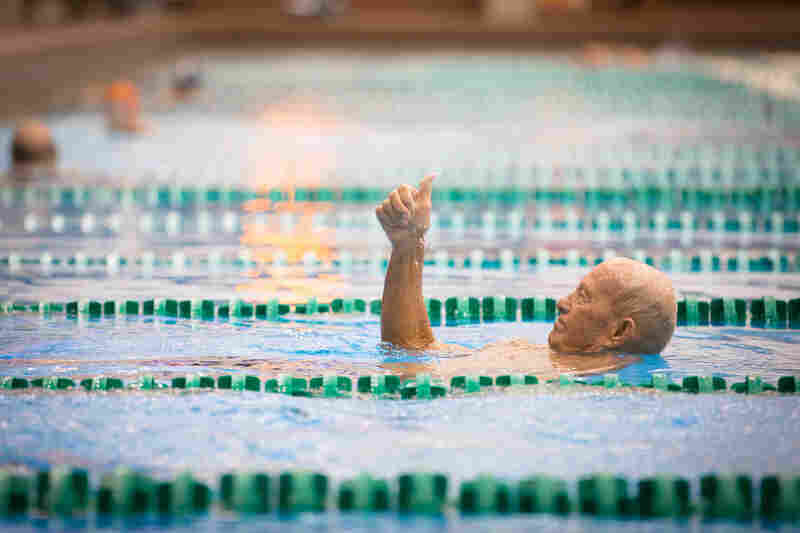 Over the decades, Johnston has set world records in various age groups for older swimmers. He's in several national and international swimming halls of fame. Back in 1952 he represented South Africa in the Olympics. But as an Olympian, he describes himself as an "also-ran." Janice Johnston sits with Graham after his races at the Cleveland State University Natatorium on Wednesday. She attends every one of his practices and races, cheering him on. "Unfortunately, when I had to train for the Olympics, I didn't have much money and I couldn't eat very well," Johnston says. "And I probably only had one half-decent meal a day. And I think I had some malnourishment. I never got in the final. I missed the final by one position." Johnston came to the United States on a swimming scholarship from the University of Oklahoma. That's where he met his wife, Janice. It was during their freshman year. Janice says, "He just didn't swim fast enough to get away." She goes to every one of her husband's races. "I love being his cheerleader," she says. Or as her husband puts it: "She's my athletic supporter." Not only is Janice Johnston at all of her husband's races; she's at every practice too. That's five or six trips to the pool each week, every week. Johnston used to train twice a day but hasn't for the past four years. "I find I'm too tired," he says. 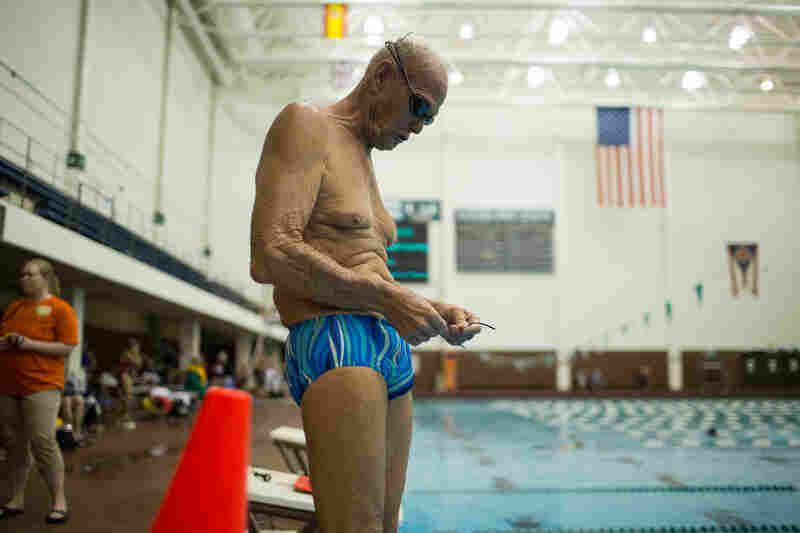 That regimen began 40 years ago when he discovered Masters Swimming, which organizes competitions for adults. As with the Senior Games in Cleveland, competitors are grouped by age in five-year increments. And more recently, Johnston has taken up open water swimming, making the trip across the Straits of Gibraltar and swimming from the Hawaiian island of Lanai to Maui. There was "a 20-foot tiger shark in Maui one year," says Johnston with bravado, "but it wasn't hungry." Still, he knows that no amount of attitude, competition or rigorous training can defeat the toll of age. "As your body ages, all your physical equipment deteriorates," he says. "I feel a lot older and I'm getting a lot slower, but so is everybody else." He jokes that lot of his competition is already dead. "But I'm still here," he says with a chuckle. Johnston still has living competition, and he joined them in the pool for the 200-meter freestyle. He holds the Senior Games record in this event for his age group. He didn't beat the record, but he beat the guy who came in after him by 41 seconds. So Johnston got another gold medal. But he says medals have never motivated him. In fact, he's given pounds of them away to kids he's coached. He's in it for the camaraderie at the pool, he says, and the thrill of the race. "That's what makes life exciting," he says. "You've got to get that adrenaline high." And that's something that doesn't change for athletes, no matter what their age.